Hawaii Pacific University Guest Blogger Student Series. 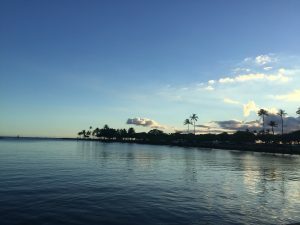 After a relaxing bus ride from Fort Street Mall to Ala Moana, and a stop in Foodland for non-perishable food, as well as a two-hour bout of loitering in Barnes & Noble, I walked through Magic Island and eventually found the travel2change group. There were around ten of us, some with prodigious yogic talents, and others, such as myself, who could hardly even bend at the knees. Jonathan, the group leader lit candles and in many subtle ways crafted an ambiance for our little group. Unfortunately, a complete stranger posted up about thirty feet behind us and blasted talk radio through low-quality speakers. I could hardly hear Joseph. But I remembered that yoga was for nothing if not acceptance of the present moment, and therefore I should accept the frustrating blast of sound as part of my journey into present awareness. It was difficult but quite funny in a way. The hour of yoga itself was enjoyable, though it forced me to confront my own limitations in both flexibility and strength. Several times I found myself tottering over onto the ground, groaning, sweating, shaking, and occasionally giving up on a position altogether. Jonathan is a good teacher and led the group effectively. The session felt much more like a spiritual practice than a workout, and I didn’t feel whatsoever judged for my own inexperience. In fact, I felt encouraged to get in touch with my own body and come to understand where I was having the most trouble with flexibility and strength. Just Before Sunset at Magic Island. Overall, it was a great experience, and I’m happy I could simultaneously do yoga whilst also helping the community. I would recommend this experience to anyone.